Jasper, Alberta is one of the very best mountain getaways you can experience in Canada! Located just a 3.5 hour-drive from Edmonton or 5 hours from Calgary, Jasper National Park is the largest national park in the Canadian Rockies. I end up visiting Jasper at least twice a year (if not more) and over the years I’ve amassed a fair bit of ‘what to do’ blog posts. 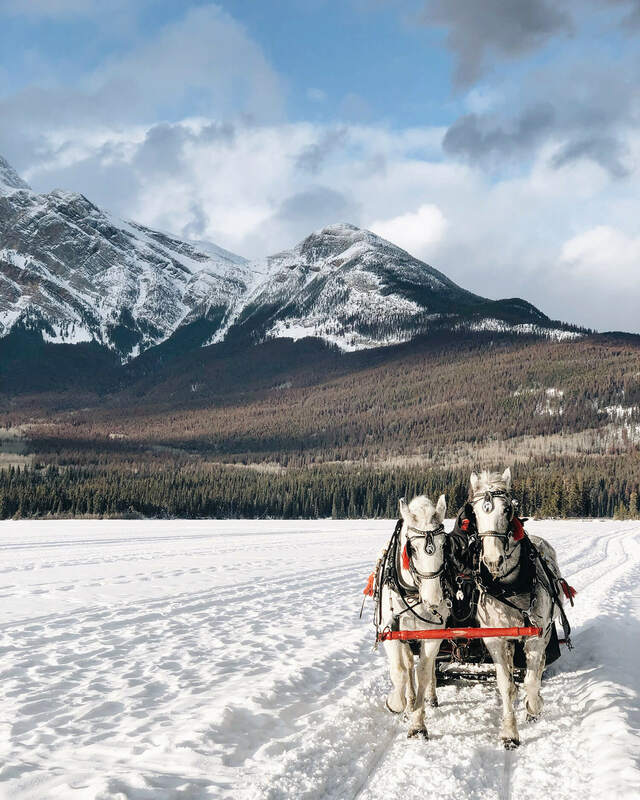 There’s lots to do in Jasper and I thought I’d use my most recent visit this winter (on a hosted media weekend with Tourism Jasper) to bring together all the different ideas and activities into one Ultimate Jasper, Alberta Travel Guide! If you’re thinking of coming to Jasper, you’ve got use this guide to help plan your visit! 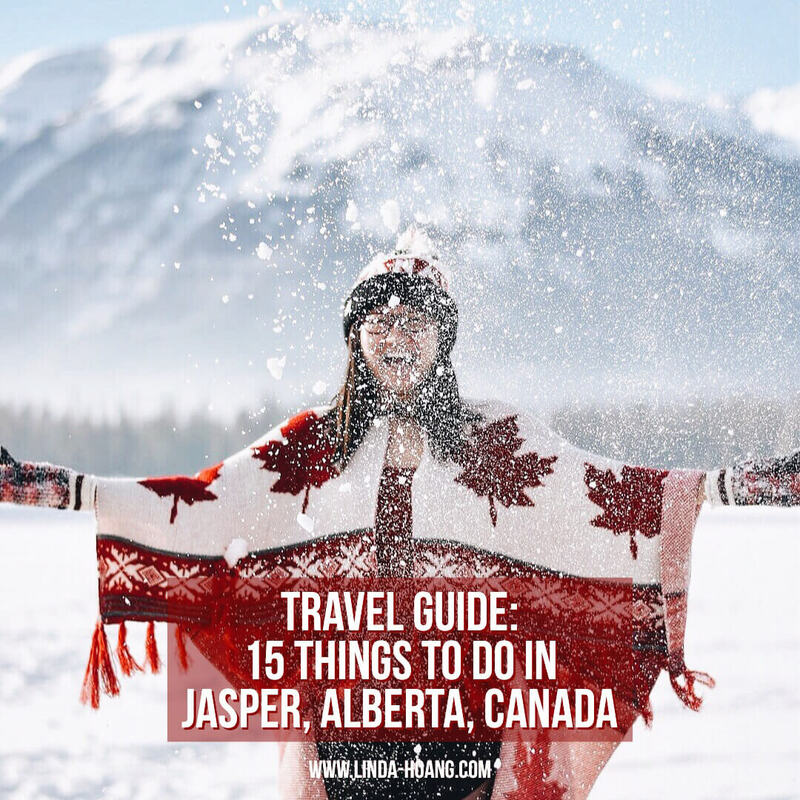 Pin + share this post: 15 Things To Do in Jasper, Alberta, Canada! 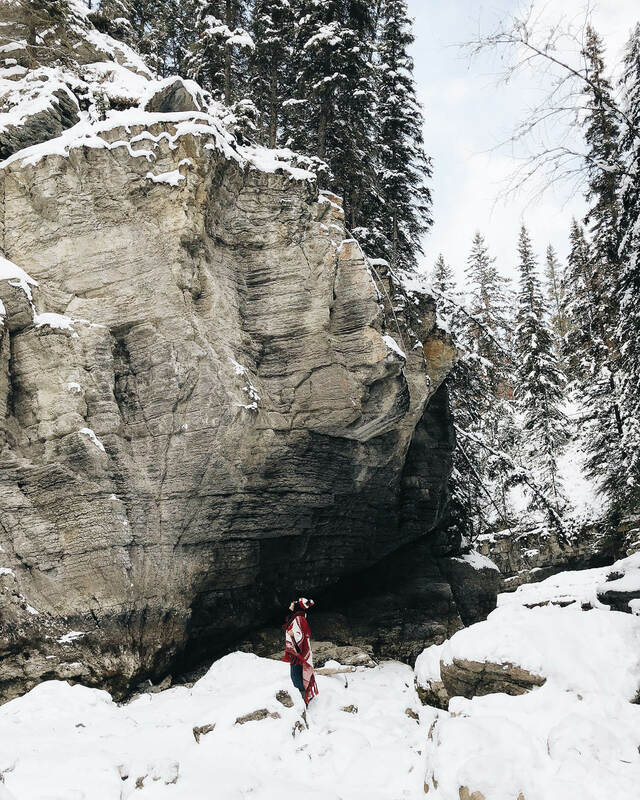 Do an Ice Walk of Maligne Canyon while in Jasper, Alberta. You’ve probably seen a photo of the Maligne Canyon IceWalk. It’s the epic, Instagrammable, brochure shot often used to highlight Jasper’s beauty. It’s an awesome and fairly easy hike that takes you through the deepest accessible canyon in Jasper National Park. You can hike it on your own or do one of a few different guided tours (when we went, we had an awesome tour guide Lutz of Sun Dog Tour Company). A lot of people ice climb in the canyon, but how far you can go really depends on consecutive cold days. On our most recent visit mid-January, it hadn’t been cold enough consecutively to allow us to safely hike to what’s called the Queen of Maligne, the truly impressive, towering frozen waterfalls, but the views we did experience were magnificent. Best Time To Do This: I’m going to say winter, so you can get the majestic, icy views! Skating at Lake Mildred on the Fairmont Jasper Park Lodge grounds! 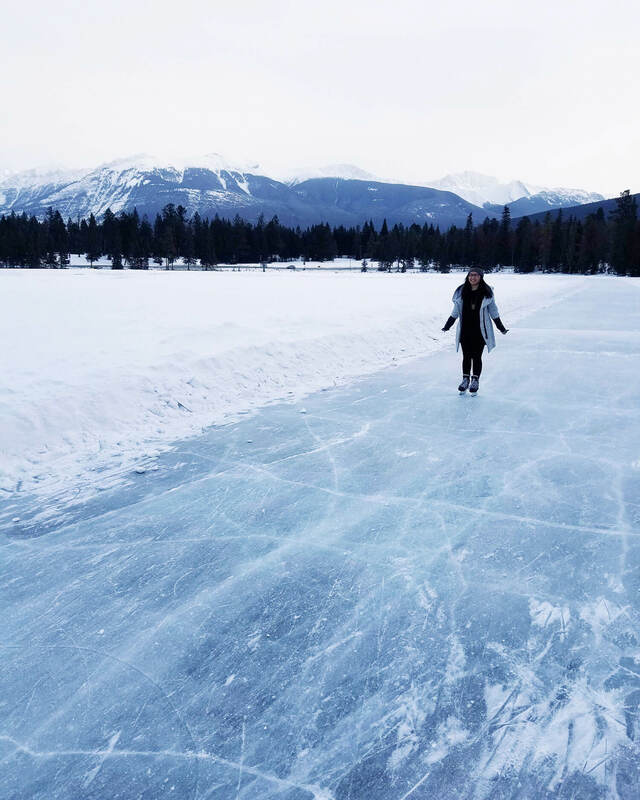 Lake Mildred, located on Fairmont Jasper Park Lodge grounds, is the biggest skating oval in Jasper. There’s also a hockey rink for pick-up games! Lake Mildred, along with Lac Beauvert, Lake Edith and Lake Annette, are Jasper National Park’s Kettle Lakes, which means they were formed during the end of the ice age and are fed by Medicine Lake. When it’s not wintertime, these lakes are blue-green. It’s a great skate with a mountain view. Bring your own or rent some at the Lodge. You can also skate with a mountain view at Pyramid Lake! Best Time To Do This: Winter, because you can’t skate on the lake when it’s not frozen lol. 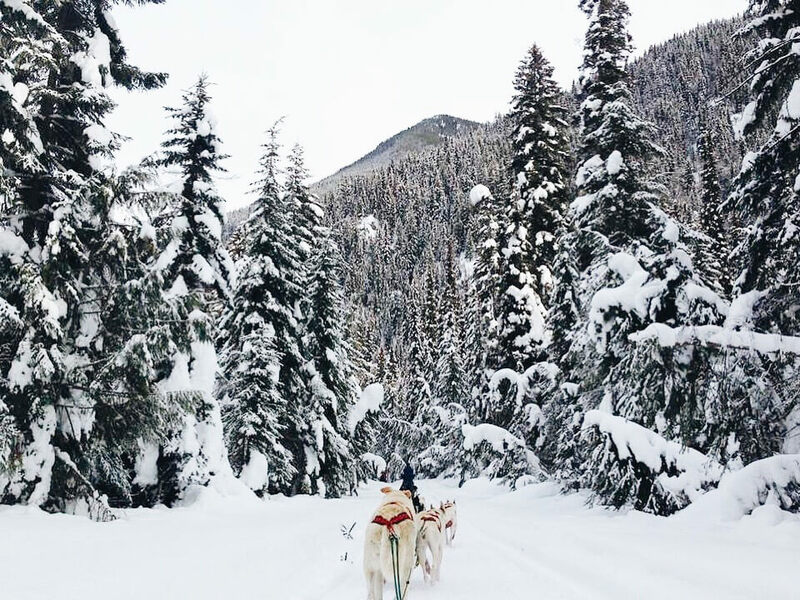 Dog sledding in the Canadian Rockies is epic! For Valentine’s weekend a few years ago, Mike and I went dogsledding in the Canadian Rockies! The tour company we went with (Cold Fire Creek Dog Sledding) advertised as a top Google search for ‘Jasper dogsledding’ but the sledding actually takes place near Valemount, B.C. about 120 kms (one hour drive) west of Jasper. We had an awesome time (read the old blog post here) and Cold Fire Creek is actually the primary dog sledding company promoted through Tourism Jasper as well but there are some dog sledding opportunities in Jasper too—during Jasper in January Cold Fire Creek also offers shorter dog sledding experiences on Pyramid Lake! Best Time To Do This: Winter, because sleds don’t really work in the summer, lol. Our white water rafting group! If you’re visiting Jasper in the summer, a rafting adventure down the Athabasca River white water rapids must be on your itinerary! It’s so much fun! 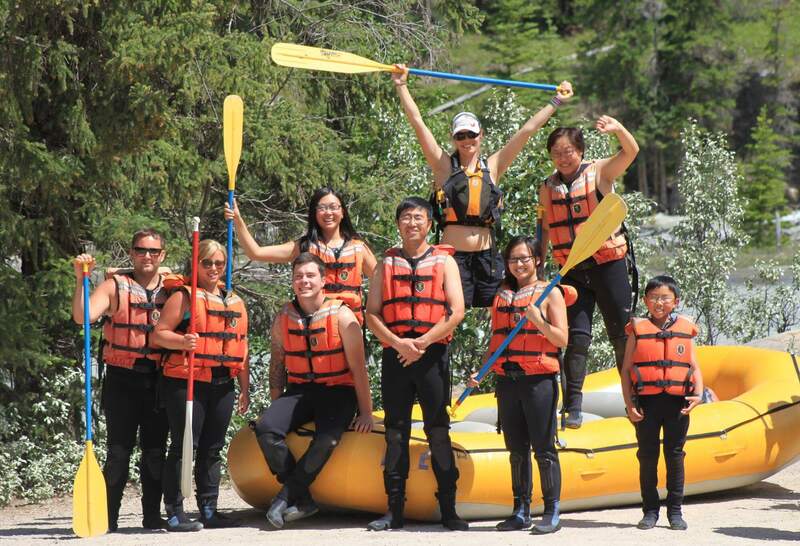 We did the Class 2 Introduction to Whitewater Rafting tour with White Water Rafting Jasper a few years ago with Mike’s sister and brother-in-law. It’s a tour that works for all ages (as young as 6 and as old as 90!) The scenery was breathtaking. Seeing Jasper by raft is so special. But the actual rapid, water splashing against your face thrill only really occurred a few times during this beginner tour, so when we do it again, we’re doing the non-beginner experience! (If you’ve never been, you should do the Intro class though). Hitting the slopes at Marmot Basin during Jasper in January a few years ago. 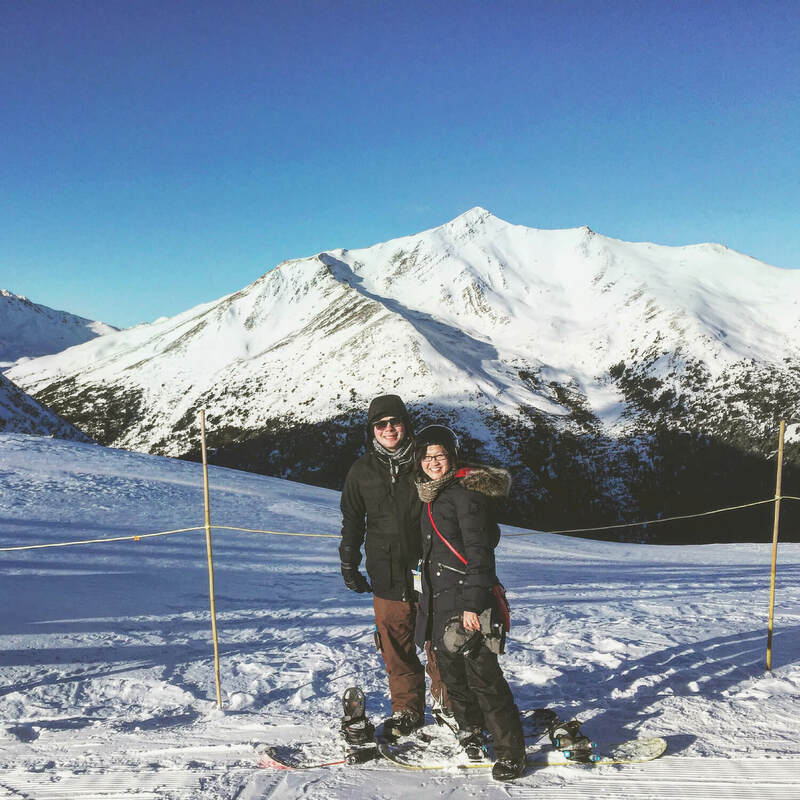 A popular activity to do in Jasper is hit the slopes at Marmot Basin Ski Resort. A couple years ago I took advantage of the Marmot Basin Snow School, where we had an instructor work with us on the hill. Mike is a seasoned snowboarder so he didn’t need it but I found the professional support really helpful. There are SO many trails at Marmot Basin, nearly 100 over 4 different mountains, so there’s something for all skill levels. But even if you just want to go up and down a few times and then hit the chalet, that’s a pretty lovely time too. Highly recommend going on a Jasper Food Tour for food and drinks at multiple eateries in Jasper! I love doing food crawls when I travel. I find it a really great way to get a taste of a few different restaurants, and learn a lot of history and food history about a particular neighbourhood or city. Jasper Food Tours just started operating April 2018 and when we went six months after they started, they said there had already been over 700 tour attendees! Clearly there’s some demand! Our tour guide Estelle was amazing. She shared so much history about Jasper that I’d never realized before (despite my multiple visits). A long-time Jasper resident (over 20 years), Estelle’s tours run daily, year-round. 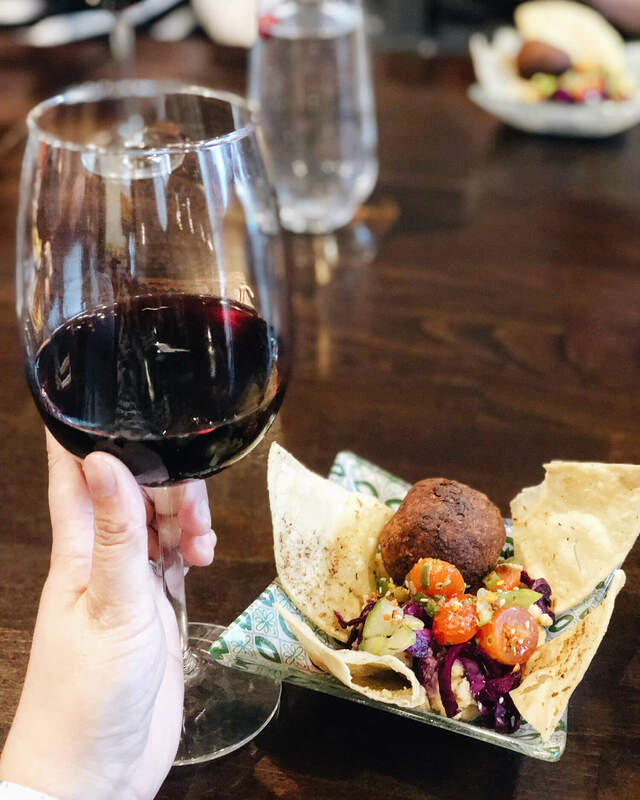 We made 4 delicious stops at 4 awesome Jasper restaurants (I’m not going to tell you where so it’s a surprise when you go!) that featured eats and drinks at each location. Estelle also mentioned she’s working on getting two other experiences approved—a Bites on Bikes tour (biking around Jasper National Park and eating at stops outside of the town along the way) as well as a Backcountry ‘Peak-nic’ experience where you’ll hike and then cook up your own meal in the mountains. Watch for those when you’re booking, but otherwise the Downtown Crawl is packed with fun tidbits and delicious food. Something we learned on the crawl was that a number of long-time families in Jasper are actually of Greek descent, so the Greek style or Greek fusion is pretty predominant at Jasper eateries. As well, because of the diverse group of people working in the hospitality industry in the town, you’ll also find that diversity influences the cuisine here. Highly recommend. Best Time To Do This: Anytime! Tours operate year-round. 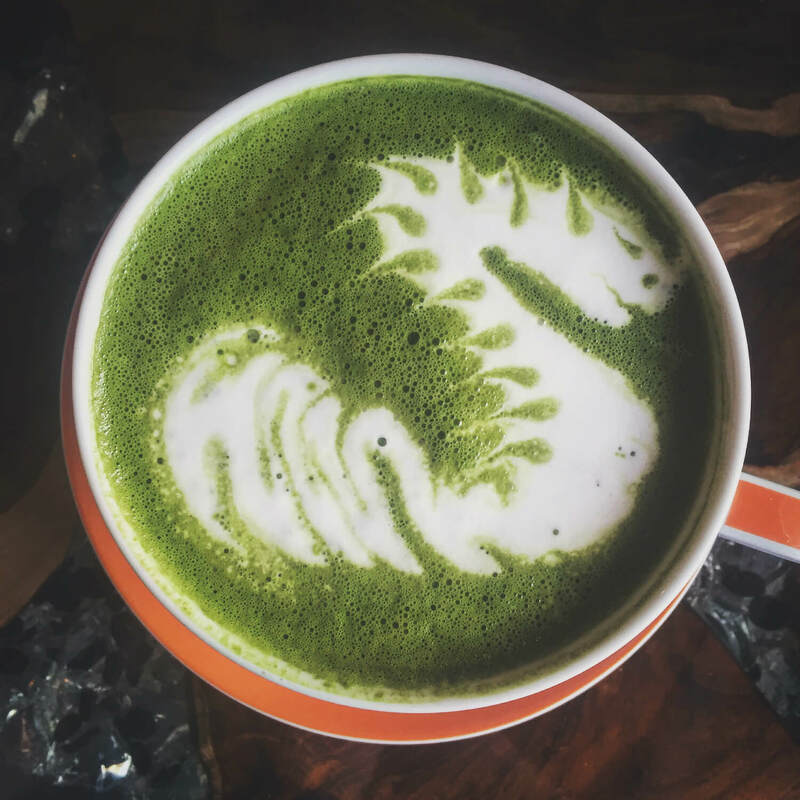 A wicked matcha latte from Wicked Cup in Jasper! What kind of food-focused / travel blogger would be if I didn’t have restaurant recommendations for you in a Travel Guide? Mike and I have had the absolute pleasure of eating at a lot of Jasper restaurants over the years (though there are a few still on our to-try list!) If you’re looking for a cute cafe, try the Wicked Cup or the Bear’s Paw Bakery. (I’ve also heard great things about Coco’s Cafe and Sunhouse Cafe, but haven’t had a chance to try). If you want something for an occasion, do Orso Trattoria or Oka Sushi at the Fairmont Jasper Park Lodge, or Tekkara Restaurant. If you want some good beers and a casual atmosphere, go to the Jasper Brewing Company (part of the Banff Brewing Company, Wood Buffalo Brewing Company and Last Best Brewing in Calgary family) or D’ed Dog Bar & Grill (this spot is where you’ll find all the locals! They also have a really cool memorial wall for locals who have died too soon. That sounds morbid, but it was really nice when it was being described to us). A few other great Jasper eateries include Evil Dave’s Grill, The Raven Bistro and Olive Bistro. I’ve also heard great things about the Kimchi House (Korean) Restaurant and Syrah’s of Jasper. Needless to say, you’ve got some great eating options in Jasper! Best Time To Do This: Anytime! You always need to eat, lol. 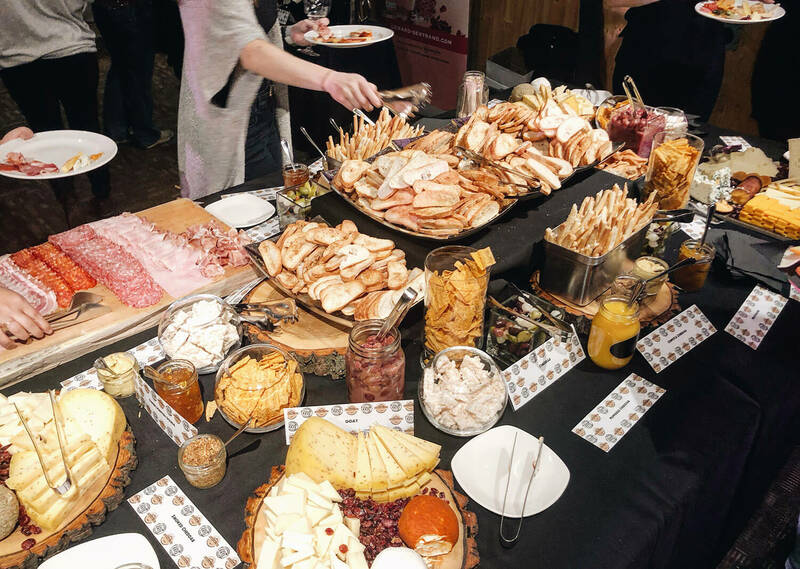 Just some of the spread at Whiskey Wine & Hops Jasper in January food festival! January is arguably the very best time to visit Jasper because during this month, the whole town is abuzz with Jasper in January, a festival with tons of activities like live entertainment, food and wine events, and outdoor adventures and activities like fat biking, dog sledding, skating, skiing and more! There are deals on skiing, street parties, food events, and concerts, to name just a few activities, and that’s in addition to all the non-Jasper in January activities you could do on your own too. There are some new activities each year, but also return favourites. The Whiskey, Wine & Hops event is always a huge food and drink party (all you can eat food and drinks for one price), and one of the highlights of our recent trip. And a few Jasper in Januaries ago we took part in free snowshoe, tracking and backcountry cooking lessons. If you’re planning a winter visit to Jasper, timing it with Jasper in January would be a really great idea. Best Time To Do This: January! The third weekend is usually the one with the food events so I usually plan for that, but the final wrap-up weekend is supposed to be a great party too. 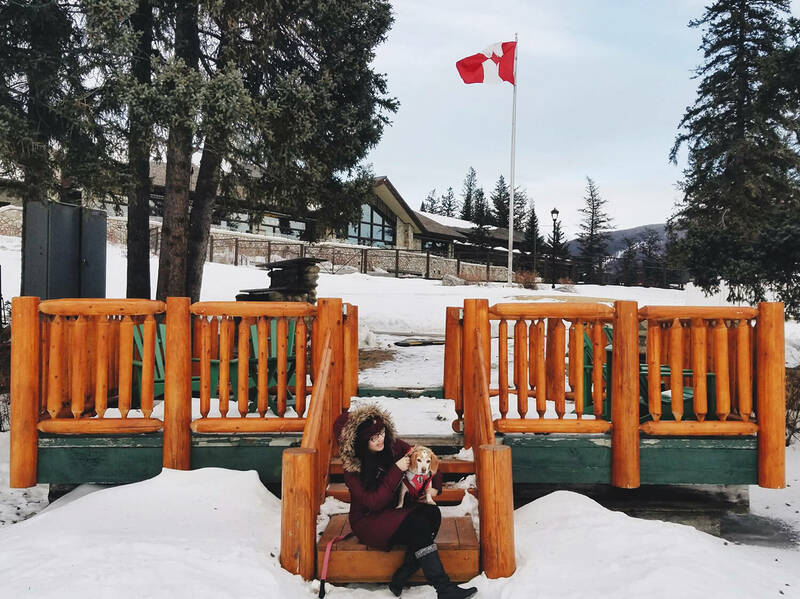 The dog-friendly Fairmont Jasper Park Lodge is a lovely place to stay in Jasper! When visiting Jasper, we love staying at the Fairmont Jasper Park Lodge. The cabins are lovely. Lac Beauvert and the rest of the grounds are lovely. The hot tub is lovely. The hospitality is always lovely. Plus the Fairmont JPL typically puts on awesome events so spending a weekend there for an event is also a really great thing to do in Jasper. We’ve been to Christmas in Novembers, Devour Food Film Festival, and Dog Days of May at the Fairmont Jasper Park Lodge and each and every event has always been incredible (the goodie / welcome bags you get at different events is also very nice). If you’re coming to Jasper, consider treating yourself with a stay at the Fairmont JPL. Alternatively, if you’re looking for a spot closer to downtown amenities, we’ve also had a great stay at Mountain Park Lodge’s The Crimson Hotel. Staying right in town at a hotel like The Crimson is really great because then everything is in walking distance. This hotel is really nice, features a lot of Canadiana decor, and is slightly cheaper. Best Time To Do This: Anytime! You’ll always need a place to stay when visiting Jasper. 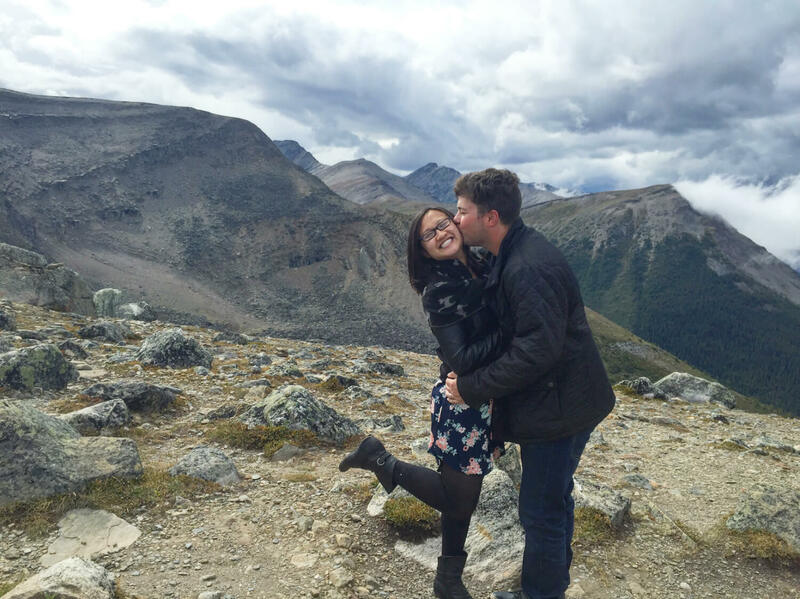 Getting some kisses on the top of Whistlers Mountain after a ride on the Jasper SkyTram! I blogged before that I think the Jasper SkyTram gives you one of the best value for your money when it comes to paying for Jasper adventures. Take the SkyTram up to Whistlers Mountain (2,500m above sea level), where you can hit a hiking trail to the Summit, take in the Rocky Mountains (you’ll see Mount Robson, the highest mountain in the Canadian Rockies), or dine at the mountain top restaurant. Some people even choose to hike up the mountain and then take the tram down, or vice versa. This could be a few hours of your day or your whole day, depending on what you decide to do with hiking. You can get a half price ticket if you only take the tram one-way). But these views are stunning. Best Time To Do This: The Jasper SkyTram runs March to October. Views from the Glacier Sky Walk. Another awesome adventure you can do in the Jasper area is doing the iconic Columbia Icefield Glacier Adventure. The Columbia Icefield is the largest icefield in the Canadian Rockies and feeds several glaciers including the Athabasca Glacier, the most-visited glacier in North America. With this adventure you can ride a massive Ice Explorer vehicle and walk on the solid, ancient ice glacier. It’s truly a unique experience. 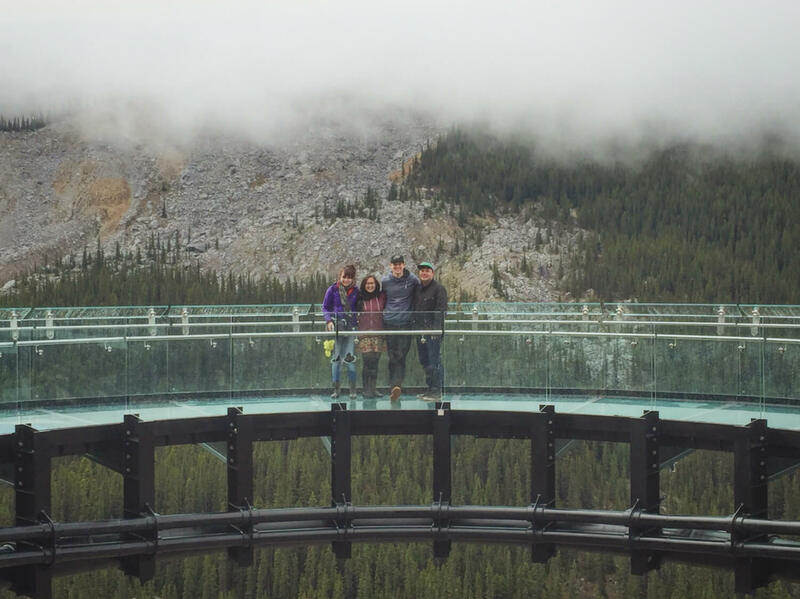 Typically this adventure (part of the Banff Jasper Pursuit Collection of adventures) can also be paired with a visit to the Glacier SkyWalk—a glass floor observation deck 918 feet above the Sunwapta Valley floor, hanging off the side of a cliff! Walk along this cliff-edge outdoor museum and learn about the valley and area wildlife. This SkyWalk will likely take your breathe away! Best Time To Do This: They accept bookings typically from April to October. 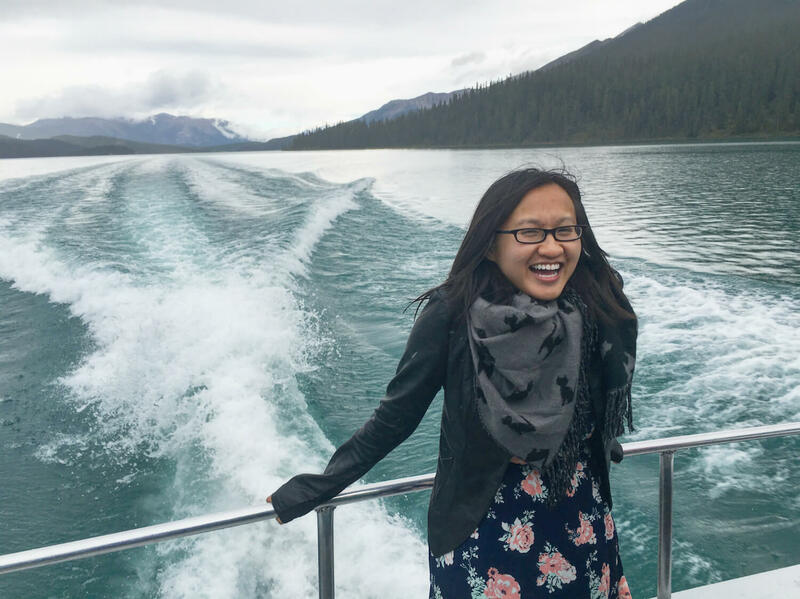 Cruising Maligne Lake to the iconic Spirit Island in Jasper National Park! When it’s not frozen, a boat tour on Maligne Lake to Spirit Island is a really lovely thing to do in Jasper. Spirit Lake is a picturesque, world-famous island and an iconic landmark in Jasper. If you take the boat tour, you’ll learn a lot of cool facts, including details about Mary Schaeffer, the first non-Indigenous explorer credited with discovering the area. She actually named one of the mountains Mount Sampson, after the Indigenous man who drew her a map to the lake!) This is a very casual adventure, and easy loop/hike around the island. It’s also a tour put on by the Banff Jasper Pursuit Collection (they do great tours!) If you’re not interested in a boat tour you can also book camping grounds around the lake, or rent a canoe or kayak too. Best Time To Do This: They accept bookings typically May to September. During the winter you can take a horse drawn sleigh ride on Pyramid Lake! Mike and I went on just the loveliest horse-drawn sleigh ride around Pyramid Lake this Jasper in January. We have also had a lovely picnic at Lake during the summer. Pyramid Mountain is RIGHT THERE so the view is just unbeatable. Mountain Park Lodges also owns the Pyramid Lake Resort, where you could stay to be right near kayaking, canoeing, paddleboating, and mountain bike rentals in the summer, or skating, snow shoeing, cross-country skiing and horse drawn sleigh rides in the winter. It’s a really scenic, awesome area with lots of outdoor activities. Best Time To Do This: Depends on what outdoor activities you’re looking for! The area is accessible year-round. A view of Miette Hot Springs. Photo Credit: Mountain Park Lodges on Instagram (@mpljasper). At least one of your visits to the Canadian Rockies requires a stop to a Hot Springs. In Jasper National Park, that visit would be to Miette Hot Springs! 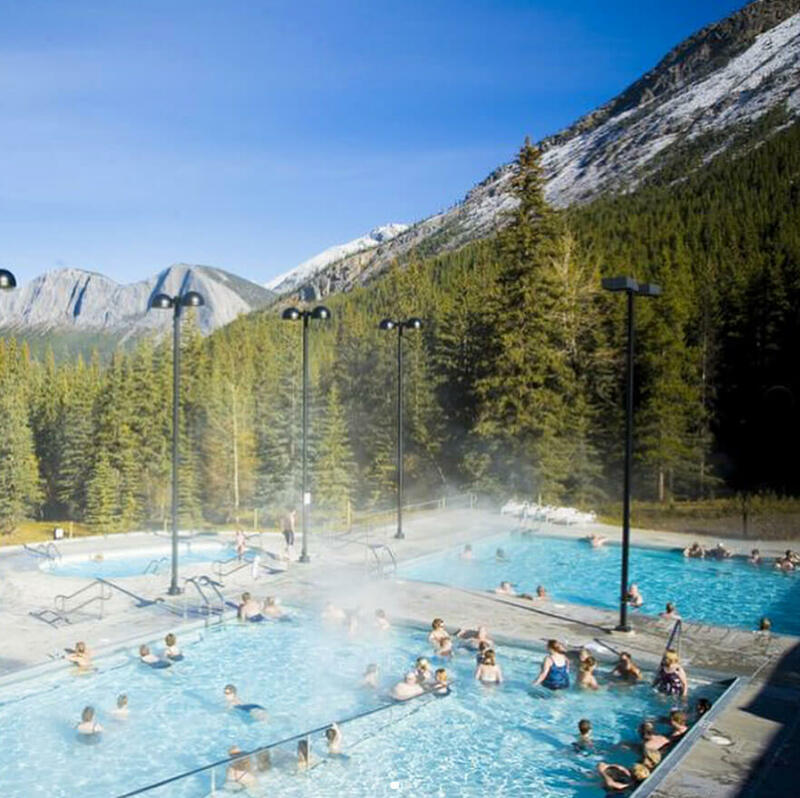 The Miette Hot Springs features the hottest mineral springs in all of the Canadian Rockies. Personally, I love a hot spring that looks and feels more rocky. I find most hot springs give off a regular swimming pool vibe, lol, but it’s still really cool that this pool / these springs are naturally hot and a dip in these springs will leave your body feeling real relaxed. Best Time To Do This: The website says the Miette Hot Springs are typically open May to September. Okay this one I haven’t done yet (but I have another Jasper trip planned in March where I intend to do this!) 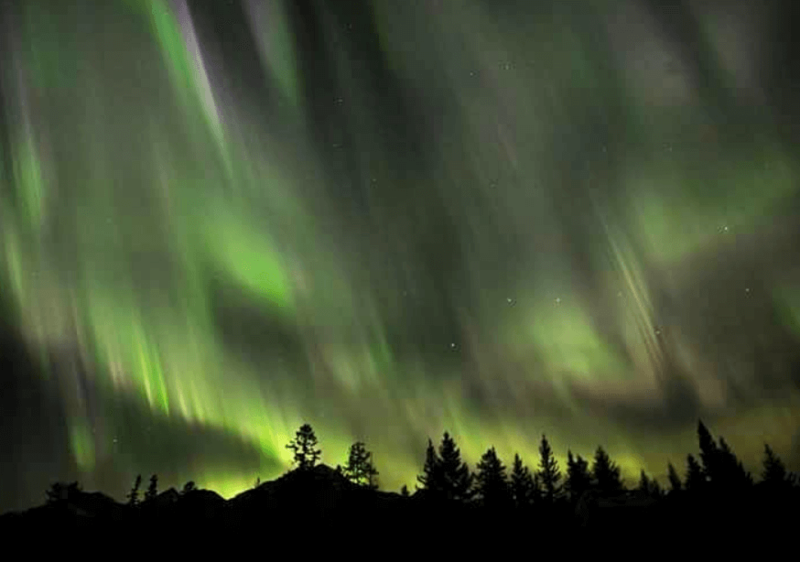 but did you know Jasper is home to the second largest Dark Sky Preserve in the world? Jasper has one of the best conditions for dark sky viewing! As such, you can visit the Jasper Planetarium (the world’s largest astronomy park). They have astronomy guides, the largest telescopes in the Rockies, a dome theatre with a live virtual tour of the sky, and time to talk and learn from astronomy experts. I imagine it will be quite magical when I finally take in this experience, and if you’re even the slightest interested in this type of thing, this is definitely a must-do for you! Best Time To Do This: The Planetarium is accessible year-round! So there you have it! 15 things you could and should do in Jasper National Park the next time you visit or plan a visit. Well, let’s face it, you won’t be able to do all 15 things in one visit unless you’re there for some time, so please feel free to use this guide for ALL your visits to Jasper! I hope this helps you with your planning, and if you have any other questions, feel free to send me a message on social media (Twitter: @lindork. Instagram: @lindork. Facebook: Lindork)! You should also definitely just explore the Tourism Jasper website because it pretty clearly sets out things to do, places to eat and where to stay if you need more tips or ideas! I’m actually super happy I was able to sort of amalgamate my past Jasper travel blog posts in to this one ‘master’ list of to-dos. My recent Tourism Jasper trip was a nice prompt to get organized with my Jasper recommendations! Thank you Tourism Jasper for hosting me and Mike for the 2019 Jasper in January. As I’ve mentioned throughout—I love visiting Jasper, I try to visit often, and I intend to be back very soon for more adventure and experiences!! Disclaimer: I was invited to Jasper in January on a hosted media weekend with Tourism Jasper in January 2019, where I was treated to a number of complimentary experiences. This has no impact on opinions stated in this post. I am a frequent visitor of Jasper, Alberta and love sharing ideas on what to do and where to eat in this incredible spot!